Low in calories and rich in flavor. 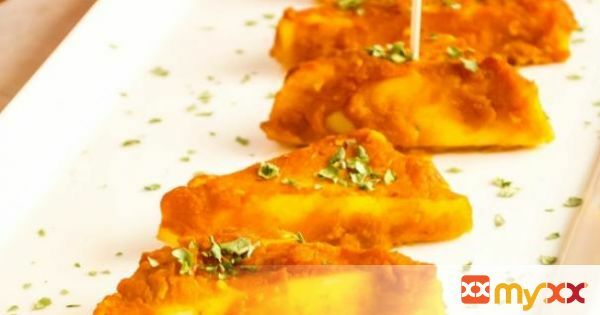 Baked paneer in pumpkin sauce is a healthy and vegetarian appetizer. 1. Preheat oven at 375 degree Fahrenheit. 2. Prepare a cookie sheet with a parchment paper and lightly grease it with cooking spray. 3. Cut Paneer into slightly thick triangles and keep it aside. 4. In a bowl combine rest of the ingredients. 5. Add Paneer to the pumpkin mix and mix gently. 6. Let it marinate for 15 minutes. 7. Transfer the Paneer pieces to the prepared cookie sheet and put it in the middle rack of the oven. 8. Bake it for 30 minutes. 9. Take it out, garnish with some cilantro and serve hot.